"always bring a sword to a gunfight"
Leave it to Springer to have some backup weapon. 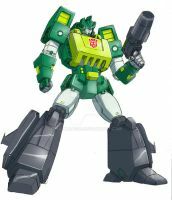 I've always loved Springer for some reason. Very well done comic. Short and sweet. Is that a homage to Time Wars I see in the first panel? Wow, thanks for all the comments guys, bit blown away by the reaction! I did get the idea hile watching Star Trek Premiere here in Dublin last year , good thing I didnt mention it to a certain Mr, Roche who was sitting next to me, or else it might have ended up in a little known title called Last tand of the Weeckers! Big fat huge Thank you to Ger Hankey for the colours and ccoping tone of my original Black and White version. My First Mosaic....Now I do have better things to do tonite than Die! Here's a toast to fresh blood! Really unique artwork here. I want to see more of this team. very enjoyable. i never knew springer is so angry. who is the decepticon in the sword? Drift looks awful funny painted green.. Interesting layout, focuses the attention on what's relevant here. Springer always has better things to do tonight than die! I really like the style of this one. And the bad guy's face reflected in the sword is a great touch! I really like the Abrams Star Trek style collapsible blade! And being prepared FTW! Words to live by - literally. Wait! Isn't that the copter guy from transformers the animated movies from 1986? too true. even in a gun fight, you always need a blade for backup. you ROCK springer. "Who brings a knife to a gun fight?!"